(CelebrityAccess MediaWire) — Seventeen years after the last tour by The Cars, two original members — guitarist Elliot Easron and keyboardist Greg Hawkes — have customized a new model that's ready to hit the road this spring in the form of The New Cars. For their The Road Rage Tour 2006 Presented by VH1 Classic, they will be joined by vocalist/guitarist Todd Rundgren, fellow Utopia bassist/vocalist Kasim Sulton and former Tubes drummer Prairie Prince. Blondie will ride shotgun on the 28-city tour. For the first time ever, a full album download will be offered free with online ticket purchases, a promotion made possible by eMusic. "Blondie and The Cars broke new ground as they defined the sound of rock 'n roll in the 80s," said David Pakman, eMusic President and CEO. "eMusic and its customers share the same pioneering spirit, and as the #2 digital music service in the world, we're proud to partner with The New Cars and Blondie to be the first to offer fans an exclusive digital album with their concert ticket." "It's very rare to have as many hits as these bands have combined in one show," said Allen Kovac, CEO of 10th Street Entertainment, the management and marketing company for the bands and tour. "Audiences know these songs and want to re-experience them in a live context," said Todd Rundgren, "as The New Cars we want to pay homage to The Cars and know that the best-known songs are the essential core, what we're hanging our hats on." The Road Rage Tour 2006 will also feature Rundgren's songs along with several new songs the band recently recorded. "The Cars' music has aged very well," said Hawkes. "Todd, Kasim and Prairie are very dynamic performers, and we are all very passionate about recreating the songs and sound that people love." With each ticket purchased through VH1classic.com or Ticketmaster.com, concertgoers will receive a confirmation e-mail with a code to redeem a free download of the complete digital event album from eMusic.com: five songs performed by The New Cars (four classic songs of The Cars, recorded live and the newly penned studio track "Not Tonight") and five songs performed by Blondie (four previously unreleased live tracks and one new studio cover of "More Than This"). The confirmation email will include a link that takes ticket buyers to http://blondienewcars.emusic.com/, where they will enter the code and their email address. After supplying this information, ticket buyers will be prompted to download the album and will also have the opportunity to sign up for a free eMusic trial. All New Cars ticket purchases through Ticketmaster include a complimentary 1-year Easy Rider membership, the base level of the New Cars' official fan club, which enables them to access The New Cars Web site, email updates and The New Cars Message Board. 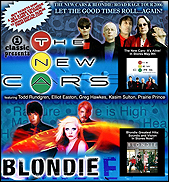 All New Cars fans have the option of buying special VIP packages during presale and general on-sale periods through Ticketmaster (or via the Web site www.thenewcars.com for non-Ticketmaster venues). These VIP packages offer a range of benefits including amazing seats, a pre-show party, backstage access, and meet & greets with The New Cars! All VIP packages include a $20 electronic gift card to The New Cars Store, and an exclusive "Express Lane" upgraded fan club membership ($20 value). Fans can join The New Cars fan clubs without purchasing tickets, by visiting www.thenewcars.com.